Panasonic's new EZ1000 doubles the peak brightness of conventional OLED as well as delivering nearly the full DCI colour space for improved HDR images - better even than the CZ950 announced at IFA 2015. This model also features an Absolute Black Filter designed to soak up ambient light and reflections. At Panasonic's CES 2017 press event we were shown the EZ1000 running many scenes with detailed, darker areas and the results looked spectacular on first view. The magenta tone that affects many OLED screens in bright room conditions is eliminated, as is the high saturation of many older OLEDs. This is all powered by the brand new Studio Colour HCX2 processor, specifically designed to overcome lost detail in near-black picture areas. Panasonic says it has learned from its heritage in plasma TVs to overcome this problem. One of OLED’s greatest strengths is its ability to create a wonderfully rich, deep black colour, but that means those pixels are essentially switched off. 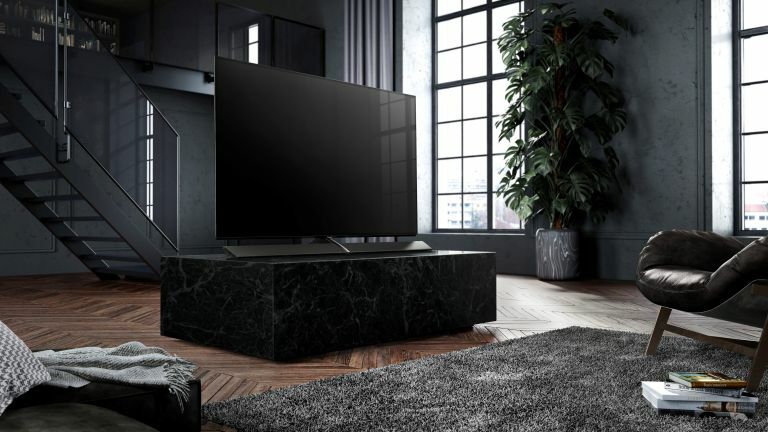 Because every single pixel in an OLED TV makes its own light also means HDR’s stunning brightness highlights and perfect blacks can share the screen simultaneously, without any of the distracting stripes or circles of accidental light you get with LCD TVs (which have to share external lights across groups of pixels). The TV's Dynamic Blade Speaker audio system houses no less than 14 multiple speaker units (eight woofers, four squawkers and two tweeters, plus a quad passive radiator to boost bass). Technics were involved in its development. The EZ1000 is naturally built for HDR and will support the new Hybrid Log Gamma HDR format - that means the TV will be compatible with the new generation of HDR broadcast services expected to be launched in 2017. Panasonic says it is in the process of applying for UHD Premium certification for the TV. Panasonic has also applied for full, independent certification from THX, The EZ1000 will support 4K HDR streaming from Netflix, Amazon and YouTube. There are also three new Ultra HD Blu-ray Players, the DMP-UB400, UB310 and UB300. Ultra HD Blu-ray is the next-generation video disc standard that not only delivers high-quality HDR 4K-resolution pictures but also supports the BT.2020 set of standards – providing a significantly wider gamut of colours which offer richer, more vibrant displays. All of them are Ultra HD Premium certified.